Increased nitrates as a result of the dry growing season are a concern not only for livestock but for humans as well. Weeds and corn are naturally high in nitrates. Nitrate levels in corn are extremely high after a rain following a dry period. High levels of nitrates increase the potential for silo gas and silo-filler’s disease. A first step for reducing the nitrate level in forages for silage is to cut the plant higher than normal. 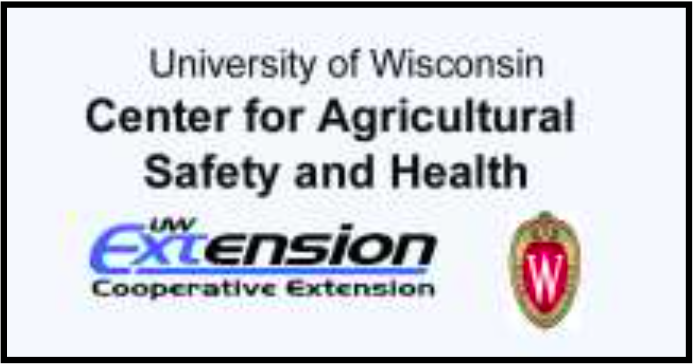 For further information on Nitrate Toxicity in Barron Corn, an article by Joe Lauer, UW Extension Corn Specialist is available at http://wisccorn.blogspot.com/2012/07/nitrate-toxicity-issues-in-barren-corn.html. Silo Gas – What is it? Shortly after green plant material is ensiled, oxygen (O2) gets used up by the crop and bacteria, and the crop begins to ferment. Some bacteria, that normally use oxygen, will use nitrates in the crop instead producing nitric oxide (NO), a non-lethal gas. 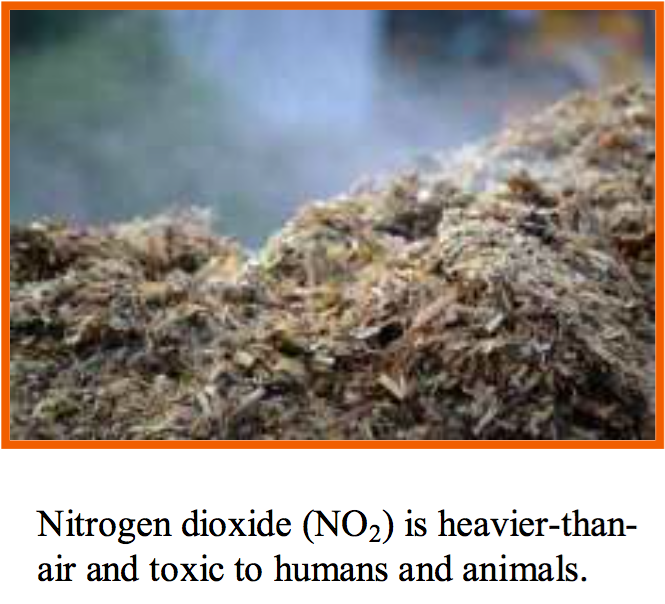 As nitric oxide leaves the silage, it combines with oxygen from the air producing nitrogen dioxide (NO2). Nitrogen dioxide (NO2) is heavier-than-air, and toxic to humans and animals. Nitrogen dioxide (NO2) has a yellowish-reddish brown color with an acrid, bleach-like smell. However, with all the other things around a silo, smell is not a reliable indicator. Carbon dioxide (CO2) is also formed in the process but often not to lethal levels. Carbon dioxide is of greater concern in a controlled atmosphere (sealed silos). Silo gas (combination of nitrogen dioxide (NO2) and carbon dioxide (CO2)) forms within a few hours up to three weeks after fresh plant material is added to the silo. It is a problem in conventional, non-airtight silos. However, it is produced in horizontal silos and silage bags as well. Silo-filler’s disease is the term given to the injury resulting from exposure to silo gas. Inhaling even a small amount can result in serious, permanent, or fatal lung injury. The nitrogen dioxide combines with water in your lungs to form highly corrosive nitric acid. High concentrations of nitrogen dioxide may make a person helpless in 2-3 minutes. Symptoms of silo-filler’s disease include coughing, burning, shortness of breath, chills, fever, headaches, nausea, or vomiting. While a person may not immediately experience the symptoms from a mild exposure, in 3-30 hours there is a slow, progressive inflammation of the lungs that results in fluid buildup in the lungs. This can be fatal. A unique characteristic of this disease is that there may be a relapse in two to six weeks after the original episode, which may be milder or more severe than the first episode. Stay out of an upright silo for at least three weeks after filling. Be alert for bleach-like odors and/or yellowish-reddish brown gases in or near silos. If you must enter the silo, e.g., to set up a silo unloader, do so immediately after the last load is in. Do not wait several hours or overnight. If you need to wait until the next day, save the last load to add before entering. Ventilate by running a forage blower at least 15-20 minutes before entering and keep it running while inside. A multi-gas monitor can be used to check for oxygen deficiency and should be set up with a sensor for nitrogen dioxide. Use of a self-contained breathing apparatus is recommended for entering a toxic and oxygen deficient atmosphere. When opening a chute door for the first time after filling, if possible, go a door above the silage level. Have someone keep in contact with you from the outside of the silo chute. 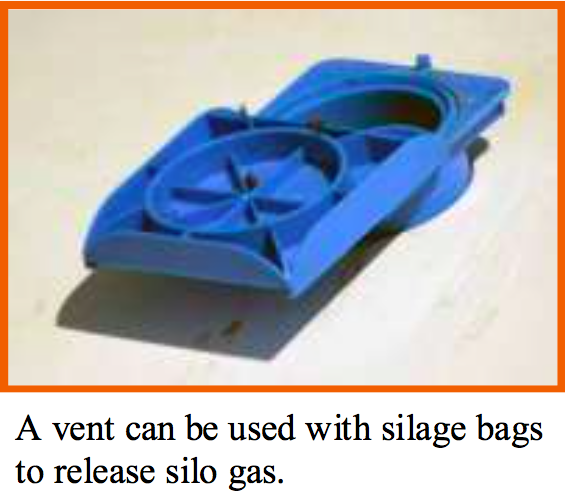 Ventilate the silo room adequately for three weeks after filling, keeping windows and doors open. Keep the door between the silo room and the barn closed to prevent silo gas from killing livestock. Consider where nitrogen dioxide gas may drift from horizontal silos and silage bags as this gas is heavier than air and may collect in other buildings or low areas. Do not puncture bubbles in plastic during the first three weeks after covering or sealing a horizontal silo or silage bag. Use caution when opening the plastic during the first three weeks after covering or sealing a horizontal silo or silage bag. If you experience throat irritation or coughing in the silo, get to fresh air immediately. See your doctor immediately after exposure to silo gas. Remember, this can be fatal! Reference: Silo Operator’s Manual, International Silo Association, Inc., 2010.